1988, 598 pages. Genre : Historical Action; Cri-Fi (Crichton Fiction). Overall Rating : B. Two intertwined stories, one set in the 1970's; the other in the 1790's. The modern tale centers around Catherine "Cat" Velis, a computer geek who's about to be transferred to Algiers due to office politics. The older tale is set primarily in France, and follows Mereille de Remy, a novice nun whose cloistered life is about to be upended by the infamous Reign of Terror. 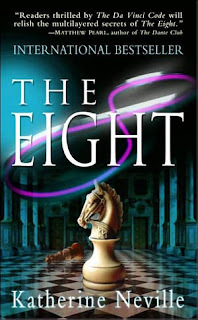 Both women soon find themselves trying to collect all the pieces to an ancient, mystical, rumored-to-be-all-powerful chess set that is also coveted by the bad guys. The emphasis is on the storyline, which is complex, but not confusing. There is the central theme of chess, which has been a lifelong passion of mine. A lot of the book takes place in Algeria, which is a nice change of scenery. Some attention even is paid to the etymology of "Car". As in "Carthage" and "Hamilcar". Kewlness. There are plenty of twists in the storyline to keep you on your toes. Telling the good guys from the bad guys is quite the challenge. Both Mereille and Cat are strong female leading characters. (Well, the queens are the strongest pieces on the chessboard.) Indeed, there really aren't any weak women in the book. Amazingly, the men aren't pansies either. Last but not least - there's even some romance. Enough to appeal to Lula, but not enough to lose me. You are reminded a few too many times that there's a "bigger game" being played. And there's too much "telegraphing" with sentences like "Little did I know that thirty blocks away, a move was about to take place that would soon alter the course of my life." (page 130). Once in a while the plot gets clunky. For example, at one point Cat is being chased by a host of gun-shooting baddies, and is forced to jump off a pier into the Mediterranean. Alas (sez you), she has a knapsack of valuables to weigh her down, including a priceless ancient book. Lucky for her, that book just happens to be in a waterproof container (in a desert? ), and she uses the weight of the knapsack to walk (underwater) along the bottom of the pier to safety, whilst the baddies wait for her to surface at the end of the pier to shoot her. Yeah. I don't think so. But these are minor. My biggest peeve with The Eight is the printing. A lot of the "e's" have their cross-bar missing, making them look like "c's". So your reading gets interrupted by things like trcc, pcacc, crcatc, ctc. This is a well-researched book. I can attest to that re the Chess parts. Some critics were turned off by the name-dropping. But I'd much rather read about Napoleon, William Blake, and Robespierre than some unknown commoner. That's what historical fiction is all about. Others didn't like the ending, but I disagree. I won't put any spoilers here; so let's just say the ending was similar to, yet better than, that of The Da Vinci Code. I recommend this to anyone who likes to read Dan Brown and Michael Crichton, neither of which has put out anything new lately. Yeah I know, Crichton's dead, but that doesn't stop Robert Ludlum. This was Ms. Neville's first published book, so the quibbles are quite forgiveable. She's written a half dozen or so since then, including (15 years later) the sequel to this story, called The Fire. I'm sure I'll be reading it sometime soon. I read this last summer and at the time, I was a little annoyed with it. It was too 80s-style in writing for me. Meaning I got really sick of hearing everyone's every outfit described in exquisite detail including brand names and price tags. It got really repetitive that way. And I was a little off-put by the name dropping (I don't even remember William Blake in there), kind of like Forrest Gump. However, a year later, when I saw the book at a library sale, I actually picked it up, because the story stuck with me more than the annoying writing things. I have The Fire on my tbr list and plan to read it at some point. I figure if she's improved in the last 15 years, and possibly ditched the awful 80s obsession with clothing, maybe I'll like The Fire a little better. my first Cricton book was (of course) Jurassic Park. which was fantastic, and made me a Crichton-junkie. i ended up reading all his books, including his first - The Andromeda Strain. to be blunt, it sucked. but it taught me not to give up on an author based only on their initial effort. the good ones get more polished as they go along. I've never read anything by him, and am probably not too likely to. I can't stand Dan Brown. Angels and Demons is arguably one of the worst books I've ever read, and it certainly turned me off of reading any others. Just not my type of writing or book, I suppose. yep. what made you read such a modern writer as Ms. Neville? this normally isn't your genre. I might give an author another try, more likely than not. I've read several authors where I won't read one of the series, but devour the other. There are some authors who are always a go no matter what s/he writes. That author could write the phone book and I'd rush out and buy and gush how great it is. Only one author does this for me, Mary Stewart is the only person and author I will name as my idol. Such mastery of language and setting, if I could write a fraction of what she does, I'd be in heaven. She also wrote the Merlin trilogy which I haven't read simply because I'm not an Arthurian. But I digress. Chess is a game I could never wrap my head around. Kind of like sewing, knitting, and ironing. I'm either all thumbs or have no interest which may have stem from the fact no one saw the need to teach me any of these. I read a mystic thriller last summer because an author stopped by our blog commenting on another post. Her book sounded interesting, but it didn't turn out ot be what I was looking for. Then, in the comments, Jen mentioned this book might be something more like I was looking for, so I picked it up. The original book, if you want to look at the review, was The Book of Names. Amanda - i didn't realize you had read/reviewed The Eight in 2008. i shooda checked. i liked your reviews (including The Book of Names), and the comments on both. Trixie made a good point - sometimes character development is important; other times i just want a fast-paced plot, and who cares if the characters are one-dimensional. Yeah, I just tend to want characters I can believe in as well as a fast plot when I'm in plot-based mode. I think it was mostly the writing that put me off. Like i said, a year later, I look back at the book fondly. bTW, i read somewhere (and I don't remember where now) that Ms. Neville introduces exactly 64 characters to us in The Eight. As in "eight-squared" and "the number of squares on a chessboard". impressive, i suppose. but trying to keep track of all of them is a PITA. Interesting. I sure didn't keep up. and Steve Berry. who gets better with each book he puts out. Haven't read him. Will have to check it out.